If you’re looking to take a leisurely stroll along the shores of a lake past glowing fall color and transparent, deep blue waters, then Rock Creek Lake is an essential stopping point for your leaf peeping expeditions. This easy 1.6 mile trail alternates between access roads to the dock and the campground and an unofficial trail used by fishermen that hugs the shoreline. 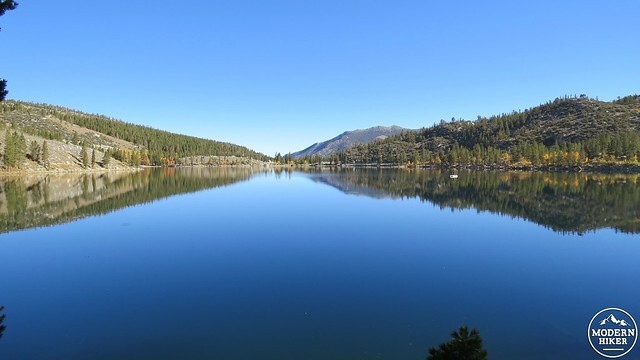 Along the way, you will enjoy views over the sparkling blue water, groves of aspens, a gurgling creek, and numerous trout sunning themselves close to the surface of the lake. Rock Creek Lake is part of a system of nearby recreational facilities, which contains numerous campgrounds, lodges, cabins, and fishing opportunities. Also available here are numerous trailheads leading to various destinations, including nearby Little Lakes Valley, equestrian facilities, a restaurant, and a general store. 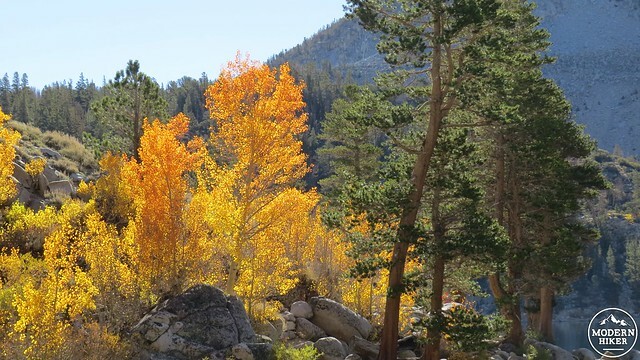 Rock Creek Lake is therefore also a good base camp from which to explore Rock Creek Canyon and other nearby canyons, such as McGee Creek Canyon and Big Pine Canyon. Starting out from the small parking lot at the beginning of the paved access road leading down to the campground, walk from your car and look for an unsigned trail off to the right. This is the beginning of the unofficial trail that wends its way around the lake shore. 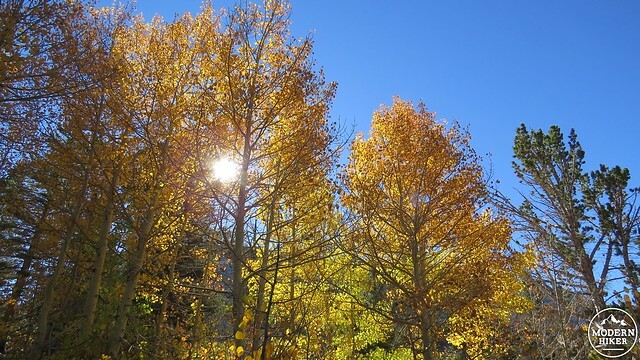 You’ll cross over a small hill dotted with aspen trees before dropping down to a small beach along another parking lot. You’ll see a dock here from which fisherman board their boats. The dock is not a bad place to take in a panorama of the lake. If you continue on the road, it will come to the group camp. Follow the stairs into the camp and seek out the continuation of the trail to the right of the campground close to the shore. 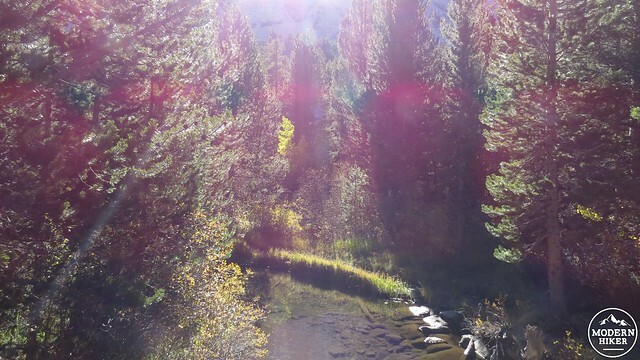 Once on the trail, you will continue to follow the shore with good views to the campground and more aspen trees directly across the lake. 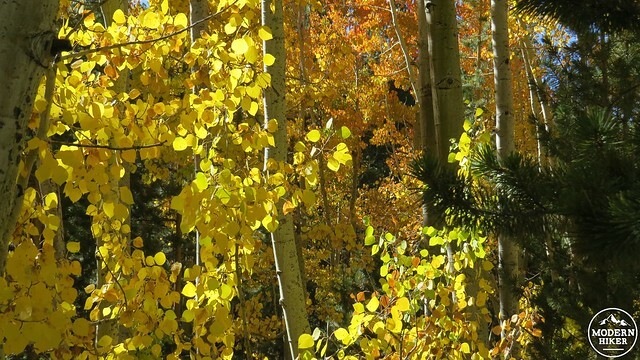 The aspens on your side will become more stunted before fading out altogether on the western end of the lake. This is a nice change in scenery as the surroundings become rockier and the conifers become denser. 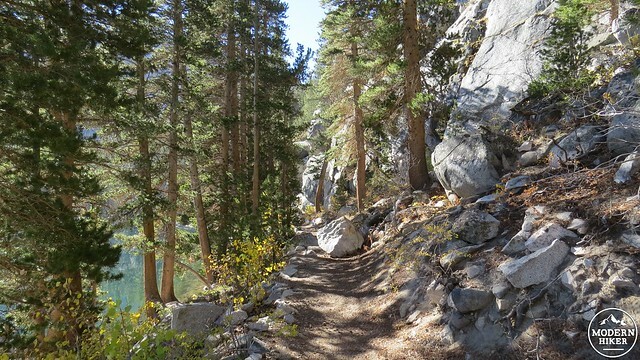 The trail will veer away from the lake shore near two walk-in camps. You’ll cross a bridge over Rock Creek just above the inlet to the lake, and then bend left to approach the lake shore yet again. The trail disappears at this point, but that doesn’t matter as you are now walking on a beach populated by fisherman and families enjoying the sunshine and the cool, blue water. 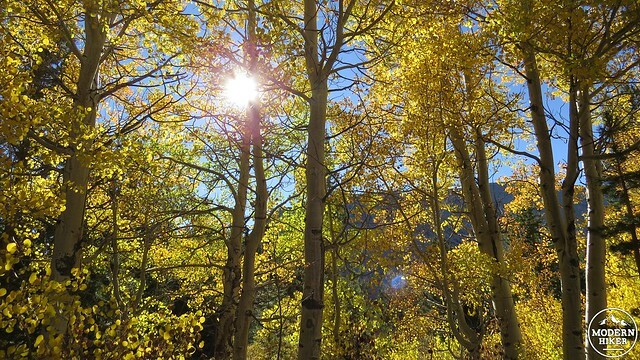 There will be aspens around you, but only in small clusters until you get back onto the road. At the opposite side of this beach, you will come once again to the road. Get back onto the road, being careful to stay out of the way of the occasional incoming car. 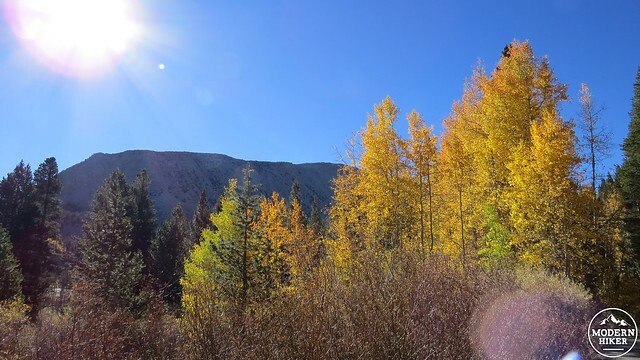 Along the right and left side of the trail, you will see a number of aspen trees in various stages of color change depending on the time of year. 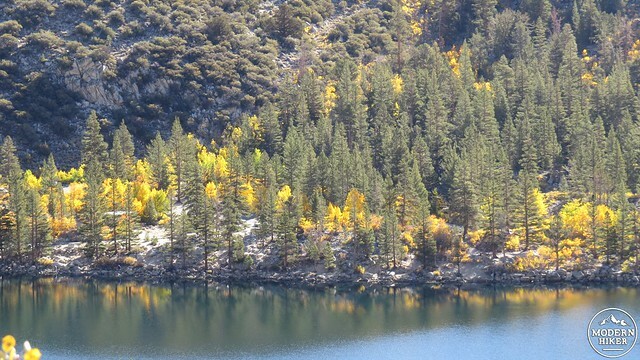 Rock Creek Lake is a bit higher in elevation than most fall color hot spots at 9,600′, so the foliage turns earlier here and disappears earlier. Peak is often the beginning of October, but it can occur earlier in late September. The track presented here dips back onto a use trail to push through some bushes and approach the lake before hopping back onto the road. You can ignore that dip and stick to the road without missing out on much. Continue on the road until you come to a junction with the road leading back to where you parked. 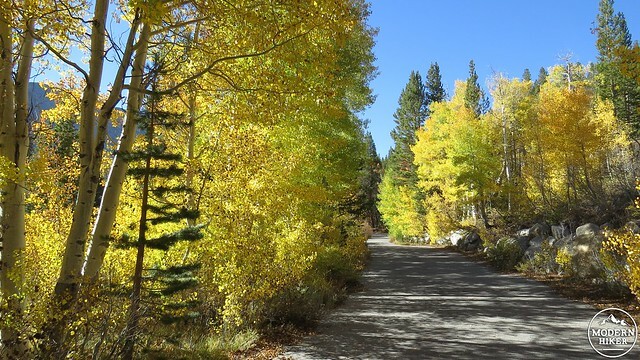 This is the end of the line, although you can take a leisurely drive down canyon to enjoy the fall foliage that will likely be centered around East Fork Campground. The trail alternates between asphalt access roads and unofficial, unmaintained trails. The trail is not marked, but it is pretty obvious which way to go: so long as you are within spitting distance of the lake, you will not go astray. 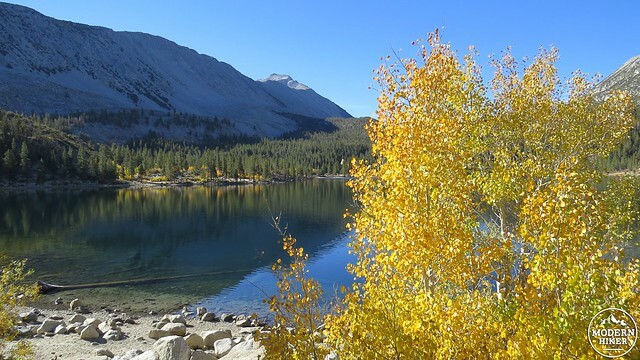 Rock Creek Lake is the closest campground, and therefore the most convenient. 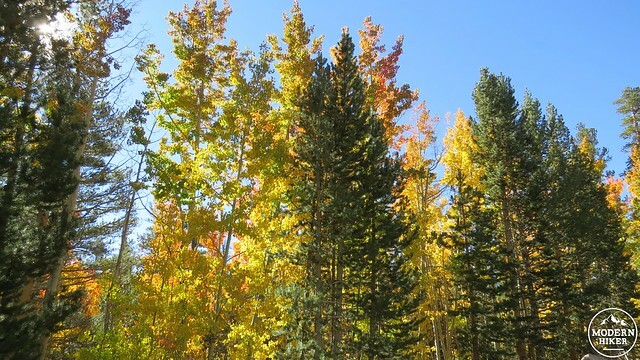 However, I will recommend East Fork Campground if you are coming here during the fall, as the campground has a much denser concentration of aspens and therefore is its own fall color wonderland. From Los Angeles, take Highway 14 to Highway 395 and follow it north past Bishop. Turn right at the exit indicating Tom's Place and Rock Creek. Follow the road into Rock Creek Recreation area and turn left onto the road indicating Rock Creek Lake Campground. Park on the left and begin your walk. Hike data, map, and photos have helped us plan our day. This is our first day on the Eastern Sierras. We want to get up in elevation, but not strain ourselves too much. We've got a few more trails posting soon for you, too. 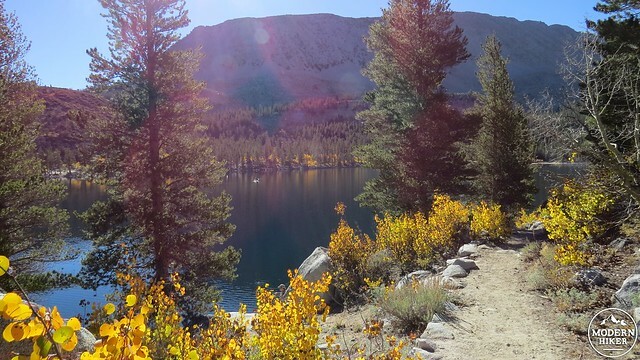 Right now, I hear June Lake is looking very, very nice, too. Thank you for posting this; just in time for my first trip of the season to Bishop for climbing. This and a few other hikes along Lake Sabina, etc. are perfect to take full advantage of the fall season to complete the trip!